Guoqiang Zhang received his Bachelor degree from the University of Science and Technology of China (USTC) in 2003, and a master of philosophy (M.Phil.) from the Unversity of Hong Kong in 2006. He studied at the Royal Institute of Technology – KTH and obtained his PhD degree in 2010. He then worked as a post-doctoral researcher at Delft University of Technology full time until the end of 2014 and part time until the end of 2016. From 2015 to 2016, he worked as a senior researcher at Ercisson AB. He is now working as a senior lecturer at the University of Technology Sydney. 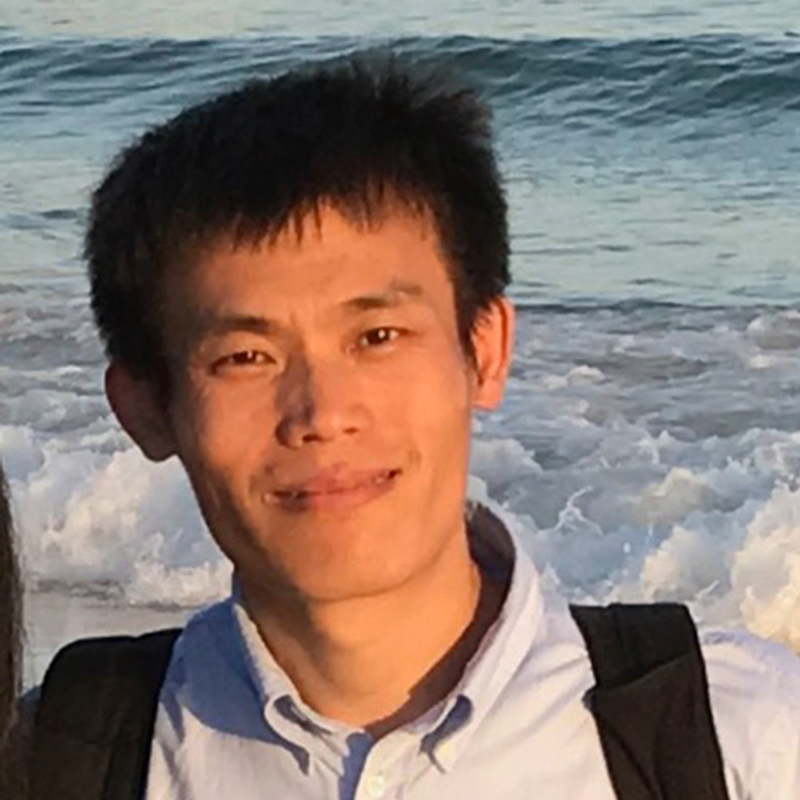 His research interests include large scale optimization, multimedia processing and machine learning. Camera-Radar Fusion Using Deep Learning (cooperation with Qamcom): Information fusion of multiple sensors brings robustness and high performance by combining the merits of different sensors. This project focuses on camera-radar fusion. In the project, the deep learning framework will be used to simutenously process video and radar signals for reliable object detection, classification, and tracking under various weather conditions. © 2019, Springer Science+Business Media, LLC, part of Springer Nature. Question answer selection in the Chinese medical field is very challenging since it requires effective text representations to capture the complex semantic relationships between Chinese questions and answers. Recent approaches on deep learning, e.g., CNN and RNN, have shown their potential in improving the selection quality. However, these existing methods can only capture a part or one-side of semantic relationships while ignoring the other rich and sophisticated ones, leading to limited performance improvement. In this paper, a series of neural network models are proposed to address Chinese medical question answer selection issue. In order to model the complex relationships between questions and answers, we develop both single and hybrid models with CNN and GRU to combine the merits of different neural network architectures. This is different from existing works that can onpy capture partial relationships by utilizing a single network structure. Extensive experimental results on cMedQA dataset demonstrate that the proposed hybrid models, especially BiGRU-CNN, significantly outperform the state-of-the-art methods. The source codes of our models are available in the GitHub (https://github.com/zhangyuteng/MedicalQA-CNN-BiGRU). © 2015 IEEE. In this paper, we propose the primal-dual method of multipliers (PDMM) for distributed optimization over a graph. In particular, we optimize a sum of convex functions defined over a graph, where every edge in the graph carries a linear equality constraint. In designing the new algorithm, an augmented primal-dual Lagrangian function is constructed which smoothly captures the graph topology. It is shown that a saddle point of the constructed function provides an optimal solution of the original problem. Further under both the synchronous and asynchronous updating schemes, PDMM has the convergence rate of O(1/K) (where K denotes the iteration index) for general closed, proper, and convex functions. Other properties of PDMM such as convergence speeds versus different parameter-settings and resilience to transmission failure are also investigated through the experiments of distributed averaging. In this letter, we propose a new message-passing algorithm for quadratic optimization. The design of the new algorithm is based on linear coordinate descent between neighboring nodes. The updating messages are in a form of linear functions as compared to the min-sum algorithm of which the messages are in a form of quadratic functions. As a result, the linear coordinate-descent (LiCD) algorithm transmits only one parameter per message as opposed to the min-sum algorithm, which transmits two parameters per message. We show that when the quadratic matrix is walk-summable, the LiCD algorithm converges. By taking the LiCD algorithm as a subroutine, we also fix the convergence issue for a general quadratic matrix. The LiCD algorithm works in either a synchronous or asynchronous message-passing manner. Experimental results show that for a general graph with multiple cycles, the LiCD algorithm has comparable convergence speed to the min-sum algorithm, thereby reducing the number of parameters to be transmitted and the computational complexity. We design a K -description scalar quantizer, whose construction is based on a structure of translated scalar lattices and a lattice in K-1 dimensional space. The use of translated lattices provides a performance advantage by exploiting a so-called staggering gain. The use of the K-1 dimensional lattice facilitates analytic insight into the performance and significantly speeds up the computation of the index assignment compared to state-of-the-art methods. Using a common decoding method, the proposed index assignment is proven to be optimal for the K-description case. It is shown that the optimal index assignment is not unique. This is illustrated for the two-description case, where a periodic index assignment is selected from possible optimal assignments and described in detail. The performance of the proposed quantizer accurately matches theoretic analysis over the full range of operational redundancies. Moreover, the quantizer outperforms the state-of-the-art MD scheme as the redundancy among the description increases. © 2012 IEEE. This paper proposes a novel method for robustly recovering the camera geometry of an uncalibrated image sequence taken under circular motion. Under circular motion, all the camera centers lie on a circle and the mapping from the plane containing this circle to the horizon line observed in the image can be modelled as a 1D projection. A 2 x 2 homography is introduced in this paper to relate the projections of the camera centers in two 1D views. It is shown that the two imaged circular points of the motion plane and the rotation angle between the two views can be derived directly from such a homography. This way of recovering the imaged circular points and rotation angles is intrinsically a multiple view approach, as all the sequence geometry embedded in the epipoles is exploited in the estimation of the homography for each view pair. This results in a more robust method compared to those computing the rotation angles using adjacent views only. The proposed method has been applied to self-calibrate turntable sequences using either point features or silhouettes, and highly accurate results have been achieved. This paper introduces a novel approach for solving the problem of camera calibration from spheres. By exploiting the relationship between the dual images of spheres and the dual image of the absolute conic (IAC), it is shown that the common pole and polar with regard to the conic images of two spheres are also the pole and polar with regard to the IAC. This provides two constraints for estimating the IAC and, hence, allows a camera to be calibrated from an image of at least three spheres. Experimental results show the feasibility of the proposed approach. Niwa, K, Zhang, G & Kleijn, WB 2019, 'Fast Edge-Consensus Computing Based On Bregman Monotone Operator Splitting', ICASSP, IEEE International Conference on Acoustics, Speech and Signal Processing - Proceedings, IEEE, Brighton, UK. bifurcations occur during the dynamic pricing processes studied. market and to satisfy regulations of a control in price volatility. Zhang, G. & Kleijn, W.B. 2018, 'Training Deep Neural Networks via Optimization Over Graphs', Proceedings of international on acoustics, Speech, and Signal Processing, International Conference on Acoustics, Speech, and Signal Processing, Calgary, Canada. Zhang, G & Kleijn, WB 2018, 'Training Deep Neural Networks via Optimization Over Graphs', Proceedings of international on acoustics, Speech, and Signal Processing, International Conference on Acoustics, Speech, and Signal Processing, Calgary, Canada. © 2018 IEEE. Recently, the primal-dual method of multipliers (PDMM) has been proposed and successfully applied to solve a number of decomposable convex optimizations distributedly and iteratively. In this work, we study the gradient based PDMM (GPDMM), where the objective functions are approximated using the gradient information per iteration. It is shown that for a certain class of decomposable convex optimizations, synchronous GPDMM has a sublinear convergence rate of O(1/K) (where K denotes the iteration index). Experiments on a problem of distributed ridge regularized logistic regression demonstrate the efficiency of synchronous GPDMM. © 2018 IEEE. A Bayesian approach termed the BAyesian Least Squares Optimization with Nonnegative L 1 -norm constraint (BALSON) is proposed. The error distribution of data fitting is described by Gaussian likelihood. The parameter distribution is assumed to be a Dirichlet distribution. With the Bayes rule, searching for the optimal parameters is equivalent to finding the mode of the posterior distribution. In order to explicitly characterize the nonnegative L 1 -norm constraint of the parameters, we further approximate the true posterior distribution by a Dirichlet distribution. We estimate the moments of the approximated Dirichlet posterior distribution by sampling methods. Four sampling methods have been introduced and implemented. With the estimated posterior distributions, the original parameters can be effectively reconstructed in polynomial fitting problems, and the BALSON framework is found to perform better than conventional methods. © 2018 IEEE. Edge consensus computing is a framework to optimize a cost function when distributed nodes have distinct data sets available to them. The primal-dual method of multipliers (PDMM) is an optimization algorithm that forms a consensus among nodes by exchanging latent variables rather than the data sets. PDMM often has a high rate of convergence. However, when the nodes see statistically heterogeneous data sets then the performance of PDMM degrades. To overcome this problem, we propose quadratic PDMM. In this method, the original cost functions are replaced by their quadratic majorization based on the L2 norm to ensure homogeneous convexity among nodes. We describe a method to set its parameters optimally for fast convergence. Our experiments confirm that the proposed quadratic PDMM provides good performance even when the data sets are heterogeneous. LU, S, Oberst, S, Zhang, G & Luo, Z 2018, 'Comparing complex dynamics using machine learning-reconstructed attracting sets', Colloquium on Irregular Engineering Oscillations and Signal Processing, TUHH, Hamburg, Germany. Recently, the primal-dual method of multipliers (PDMM) has been proposed to solve a convex optimization problem defined over a general graph. In this paper, we consider simplifying PDMM for a subclass of the convex optimization problems. This subclass includes the consensus problem as a special form. By using algebra, we show that the update expressions of PDMM can be simplified significantly. We then evaluate PDMM for training a support vector machine (SVM). The experimental results indicate that PDMM converges considerably faster than the alternating direction method of multipliers (ADMM). Linear programming (LP) relaxation for MAP inference over (factor) graphic models is one of the fundamental problems in machine learning. In this paper, we propose a new message-passing algorithm for the MAP LP-relaxation by using the proximal alternating-direction method of multipliers (PADMM). At each iteration, the new algorithm performs two layers of optimization, that is node-oriented optimization and factor-oriented optimization. On the other hand, the recently proposed augmented primal LP (APLP) algorithm, based on the ADMM, has to perform three layers of optimization. Our algorithm simplifies the APLP algorithm by removing one layer of optimization, thus reducing the computational complexities and further accelerating the convergence rate. We refer to our new algorithm as the proximal alternating-direction (PAD) algorithm. Experimental results confirm that the PAD algorithm indeed converges faster than the APLP method. In this paper, we extend the bi-alternating direction method of multipliers (BiADMM) designed on a graph of two nodes to a graph of multiple nodes. In particular, we optimize a sum of convex functions defined over a general graph, where every edge carries a linear equality constraint. In designing the new algorithm, an augmented primal-dual Lagrangian function is carefully constructed which naturally captures the associated graph topology. We show that under both the synchronous and asynchronous updating schemes, the extended BiADMM has the convergence rate of O(1/K) (where K denotes the iteration index) for general closed, proper and convex functions. As an example, we apply the new algorithm for distributed averaging. Experimental results show that the new algorithm remarkably outperforms the state-of-the-art methods. We propose a new message-passing algorithm for the quadratic optimization problem. As opposed to the min-sum algorithm, the new algorithm involves two minimizations and one summation at each iteration. The new min-sum-min algorithm exploits feedback from last iteration in generating new messages, resembling the Jacobi- relaxation algorithm. We show that if the feedback signal is large enough, the min-sum-min algorithm is guaranteed to converge to the optimal solution. Experimental results show that the min-sum-min algorithm outperforms two reference methods w.r.t. the convergence speed. © 2014 Springer-Verlag. The alternating-direction method of multipliers (ADMM) has been widely applied in the field of distributed optimization and statistic learning. ADMM iteratively approaches the saddle point of an augmented Lagrangian function by performing three updates per-iteration. In this paper, we propose a bi-alternating direction method of multipliers (BiADMM) that iteratively minimizes an augmented bi-conjugate function. As a result, the convergence of BiADMM is naturally established. Unlike ADMM that always involves three updates per iteration, BiADMM opens up an avenue to perform either two or three updates per iteration, depending on the functional construction. As an application, we consider applying BiADMM for the lasso problem. Experimental results demonstrate the effectiveness of our new method. The approximate MAP inference over (factor) graphic models is of great importance in many applications. Due to its simplicity, linear-programming (LP) relaxation has become one of the most popular approaches to approximate MAP. In this paper, we propose a new message passing algorithm for the MAP LP-relaxation problem by using the alternating-direction method of multipliers (ADMM). At each iteration, the new algorithm performs two layers of optimization sequentially, that is node-oriented optimization and factor-oriented optimization. On the other hand, the recently proposed augmented dual LP (ADLP) algorithm, also based on the ADMM, has to perform three layers of optimization. We refer to our new algorithm as the simplified ADLP (SiADLP) algorithm. The design of the SiADLP algorithm stems from a new formulation for the dual LP problem. Experimental results show that the SiADLP algorithm outperforms the ADLP method. In this paper we propose a generalized linear coordinate-descent (GLiCD) algorithm for a class of unconstrained convex optimization problems. The considered objective function can be decomposed into edge-functions and node-functions of a graphical model. The messages of the GLiCD algorithm are in a form of linear functions, as compared to the min-sum algorithm of which the form of messages depends on the objective function. Thus, the implementation of the GLiCD algorithm is much simpler than that of the min-sum algorithm. A theorem is stated according to which the algorithm converges to the optimal solution if the objective function satisfies a diagonal-dominant condition. As an application, the GLiCD algorithm is exploited in solving the averaging problem in sensor networks, where the performance is compared to that of the min-sum algorithm. In this paper we propose a new message-passing algorithm for quadratic optimization. The design of the new algorithm is based on linear coordinate-descent between neighboring nodes. The updating messages are in a form of linear functions as compared to the min-sum algorithm of which the messages are in a form of quadratic functions. Therefore, the linear coordinate-descent (LiCD) algorithm has simpler updating rules than the min-sum algorithm. It is shown that when the quadratic matrix is walk-summable, the LiCD algorithm converges. As an application, the LiCD algorithm is utilized in solving general linear systems. The performance of the LiCD algorithm is found empirically to be comparable to that of the min-sum algorithm, but at lower complexity in terms of computation and storage. In this paper we consider the rate region of the vector Gaussian one-helper distributed source coding problem. In particular, we derive optimality conditions under which a weighted sum rate is minimum by using a contradiction-based argument. When the sources are specified to be scalar, the optimality conditions can always be constructed for any weighted sum rate. In the derivation of the optimality conditions, we introduce a new concept of "source enhancement", which can be viewed as a dual to the well known "channel enhancement" technique. In particular, source enhancement refers to the operation of increasing the covariance matrix of a Gaussian source in a partial ordering sense. This new technique makes the derivation of the optimality conditions straightforward. Li, H, Zhang, G & Kleijn, WB 2010, 'Adaptive playout scheduling for voip using the k-Erlang distribution', European Signal Processing Conference, pp. 1494-1498. We propose a new adaptive playout scheme for VoIP. The k- Erlang distribution is introduced to model the packet interarrival time distribution. A cost function is proposed for the next played out packet in the buffer based on modelling packet-arrival times with the k-Erlang distribution. The cost function essentially balances the average buffering delay and the packet-loss rate. The optimal playout length of the packet is determined by minimizing the cost function and realized by either inserting or dropping pitch cycles from the packet. Our real-world data experiments show that our scheme outperforms two reference methods for both low-jitter and highjitter cases. © EURASIP, 2010. The problem of the rate region of the vector Gaussian multiple description with individual and central quadratic distortion constraints is studied. We have two main contributions. First, a lower bound on the rate region is derived. The bound is obtained by lower-bounding a weighted sum rate for each supporting hyperplane of the rate region. Second, the rate region for the scenario of the scalar Gaussian source is fully characterized by showing that the lower bound is tight. The optimal weighted sum rate for each supporting hyperplane is obtained by solving a single maximization problem. This is contrary to existing results, which require solving a min-max optimization problem. © 2010 IEEE. Zhang, G, Klejsa, J & Kleijn, WB 2009, 'Analysis of K-channel multiple description quantization', Data Compression Conference Proceedings, pp. 53-62. This paper studies the tight rate-distortion bound for K-channel symmetric multiple-description coding for a memoryless Gaussian source. We find that the product of a function of the individual side distortions (for single received descriptions) and the central distortion (for K received descriptions) is asymptotically independent of the redundancy among the descriptions. Using this property, we analyze the asymptotic behaviors of two different practical multiple-description lattice vector quantizers (MDLVQ). Our analysis includes the treatment of a MDLVQ system from a new geometric viewpoint, which results in an expression for the side distortions using the normalized second moment of a sphere of higher dimensionality than the quantization space. The expression of the distortion product derived from the lower bound is then applied as a criterion to assess the performance losses of the considered MDLVQ systems. © 2009 IEEE. Zhang, G, Lundin, H & Kleijn, WB 2008, 'Band control policy of playout scheduling for voice over IP', European Signal Processing Conference. We study adaptive-playout scheduling for VoIP using the framework of stochastic impulse control theory. A Wiener process is introduced to model the fluctuation of the buffer length in the absence of control. In this context, the control signal consists of length units that correspond to inserting or dropping a pitch cycle. We define an optimality criterion that has an adjustable trade-off between average buffing delay and average control length (the length of the pitch cycles added plus the length of the pitch cycles dropped). The clock-drift effect is treated in a unified manner within this framework. A band control policy is shown to be optimal. The algorithm does not require knowledge of the clock drift. It maintains the buffer length within a band region by imposing impulse control (inserted or dropped pitch cycles) whenever the bounds of the band are reached. Our experiments show that the proposed method outperforms a popular reference method. copyright by EURASIP. We study packet-loss concealment for speech based on autoregressive modeling using a rigorous minimum mean square error (MMSE) approach. The effect of the model estimation error on predicting the missing segment is studied and an upper bound on the mean square error is derived. Our experiments show that the upper bound is tight when the estimation error is less than the signal variance. We also consider the usage of perceptual weighting on prediction to improve speech quality. A rigorous argument is presented to show that perceptual weighting is not useful in this context. We create simple and practical MMSE-based systems using two signal models: a basic model capturing the short-term correlation and a more sophisticated model that also captures the long-term correlation. Subjective quality comparison tests show that the proposed MMSE-based system provides state-of-the-art performance. ©2008 IEEE. Zhang, G, Zhang, H & Wong, KYK 2006, '1D camera geometry and its application to circular motion estimation', BMVC 2006 - Proceedings of the British Machine Vision Conference 2006, pp. 67-76. This paper describes a new and robust method for estimating circular motion geometry from an uncalibrated image sequence. Under circular motion, all the camera centers lie on a circle, and the mapping of the plane containing this circle to the horizon line in the image can be modelled as a 1D projection. A 2 × 2 homography is introduced in this paper to relate the projections of the camera centers in two 1D views. It is shown that the two imaged circular points and the rotation angle between the two views can be derived directly from the eigenvectors and eigenvalues of such a homography respectively. The proposed 1D geometry can be nicely applied to circular motion estimation using either point correspondences or silhouettes. The method introduced here is intrinsically a multiple view approach as all the sequence geometry embedded in the epipoles is exploited in the computation of the homography for a view pair. This results in a robust method which gives accurate estimated rotation angles and imaged circular points. Experimental results are presented to demonstrate the simplicity and applicability of the new method. This paper addresses the problem of recovering epipolar geometry from spheres. Previous works have exploited epipolar tangencies induced by frontier points on the spheres for motion recovery. It will be shown in this paper that besides epipolar tangencies, N2 point features can be extracted from the apparent contours of the N spheres when N > 2. An algorithm for recovering the fundamental matrices from such point features and the epipolar tangencies from 3 or more spheres is developed, with the point features providing a homography over the view pairs and the epipolar tangencies determining the epipoles. In general, there will be two solutions to the locations of the epipoles. One of the solutions corresponds to the true camera configuration, while the other corresponds to a mirrored configuration. Several methods are proposed to select the right solution. Experiments on using 3 and 4 spheres demonstrate that our algorithm can be carried out easily and can achieve a high precision. © 2006 IEEE. This paper addresses the problem of structure and motion from silhouettes for turntable sequences. Previous works have exploited corresponding points induced by epipolar tangencies to estimate the image invariants under turntable motion and recover the epipolar geometry. In these approaches, however, camera intrinsics are needed in order to obtain Euclidean motion and reconstruction. This paper proposes a novel approach to precisely estimate the image invariants and the rotation angles in the absence of the camera intrinsics, and to perform auto-calibration. By exploiting a special parameterization of the epipoles, it is shown that the imaged circular points can be formulated in terms of the image invariants. A fixed scalar k, introduced to account for the different scales in the homogeneous representations of the image invariants used in the parameterizations, is found crucial in both calibration and motion estimation. Given the image invariants, namely the horizon, the imaged rotation axis and its orthogonal vanishing point, this scalar can be determined from the epipoles in an image triplet. A robust method for estimating k is proposed and the rotation angles can be recovered using this estimated value of k. All the estimated variables are then refined using bundle-adjustment and auto-calibration is performed using the imaged circular points, the imaged rotation axis and the associated vanishing point. This allows the recovery of the full camera positions and orientations, and hence Euclidean reconstruction. Experimental results demonstrate the simplicity of this novel approach and the high precision in the estimated motion and reconstruction. This paper addresses the problem of camera calibration from spheres. By studying the relationship between the dual images of spheres and that of the absolute conic, a linear solution has been derived from a recently proposed non-linear semi-definite approach. However, experiments show that this approach is quite sensitive to noise. In order to overcome this problem, a second approach has been proposed, where the orthogonal calibration relationship is obtained by regarding any two spheres as a surface of revolution. This allows a camera to be fully calibrated from an image of three spheres. Besides, a conic homography is derived from the imaged spheres, and from its eigenvectors the orthogonal invariants can be computed directly. Experiments on synthetic and real data show the practicality of such an approach. © 2005 IEEE. Zhang, G & Li, H 2018, 'Effectiveness of Scaled Exponentially-Regularized Linear Units (SERLUs)'. while being able to push the output of SERLU towards zero mean statistically. including ELU, SELU, Swish, Leakly ReLU and ReLU. LU, S, Zhang, G, Luo, Z & Oberst, S 2018, 'Order pattern recurrence plots unveiling determinism buried in noise'. Zhang, G, Kleijn, WB & Heusdens, R 2017, 'On Relationship between Primal-Dual Method of Multipliers and Kalman Filter'. optimizations over a growing chain graph.